This eighteenth volume in the Falco series takes the Roman holiday of Saturnalia as its backdrop. 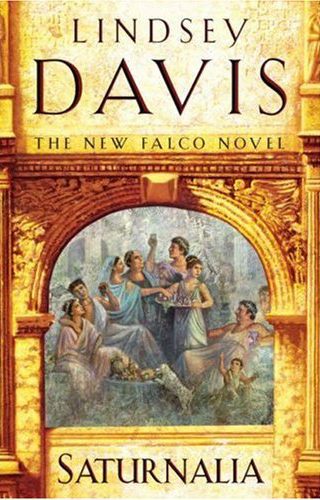 The Didius Falco family are back in Rome, following their sojourn in Greece in the last volume, and it's here that Falco operates at his best, among the various shady characters of the city. He is summoned to the palace and requested to hunt for an escaped captive who is loose in the city. The escapee is no other than Veleda, the German warrior priestess whom Falco first met in THE IRON HAND OF MARS. Then, Justinus, Falco's brother-in-law, dallied briefly with the priestess in her forest domain. Now she is loose in Rome and Falco must find her before the end of the Feast of Saturnalia. Oh, and he's supposed to work alongside the Emperor's Chief Spy - his arch-nemesis Anacrites. But then Justinus goes missing too and Falco is under even more pressure from his family to restore Justinus to his wife before he does something really stupid. The main plot cracks along in typical Falco style, with many twists and turns, and humorous situations, all set among the festival of Saturnalia, which shows many aspects similar to those of modern day Christmas - unwanted presents, hated family gatherings etc. The vigiles annual Saturnalia party is a cracker! There is also a sub-plot concerning the deaths of several vagrants in the city, giving Falco even more to handle. While I enjoyed the book immensely for the most part, I felt the ending was a little rushed, both the main and sub-plots being wrapped up in the space of a few pages, and it left me with a slightly disappointed feeling. The prose as always is very readable, at times very funny, but I thought the ending a little weak and I felt the plot deserved a better climax. Still, to be achieving this standard after eighteen novels is no mean feat and the characters and warm humour make up for the slightly lukewarm ending.